Megabus.com initiated daily express bus service from Omaha to Chicago via Des Moines and Iowa City in August 2011. The 81-seat double-decker buses offer free Wi-Fi with power outlets for all passengers, seat belts, climate control, and clean bathrooms. All buses are wheel-chair accessible and green certified. Each bus is also equipped with GPS-tracking technology for safety and convenience. This year, Megabus.com became the first bus company to launch a free downloadable app that allows customers to better track departure and arrival times which can vary based on uncontrollable circumstances such as weather conditions, road construction, or vehicle accidents. Owned by Stagecoach Group, an international public transportation conglomerate based in Perth, Scotland, Megabus.com began operations in April 2006 and is the first company to offer bus service for the ridiculously low fare beginning at one dollar for city-to-city transportation to more than 80 destinations across North America when tickets are purchased online. 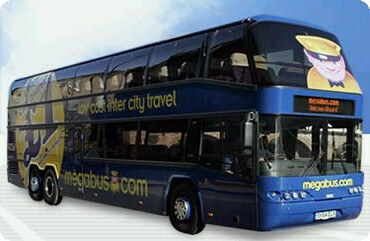 Last month, Megabus.com greeted its 20 millionth customer in North America. The company has about 50,000 Facebook fans to help spread the word about its offerings. Despite a lot of creative public relations and advertising, word of mouth and personal endorsements from family members, colleagues, and students have helped Megabus.com achieve nearly double-digit growth over the last six years. And, in just a little more than a year, the rock-star bus company is experiencing steady growth in Omaha.